The Drillstar X-Reamer is a unique underreamer, capable of extended reach underreaming through reduced clearances. Introduced in 2005, it proved itself as a reliable and efficient solution for enlarging the borehole beyond bit diameter. 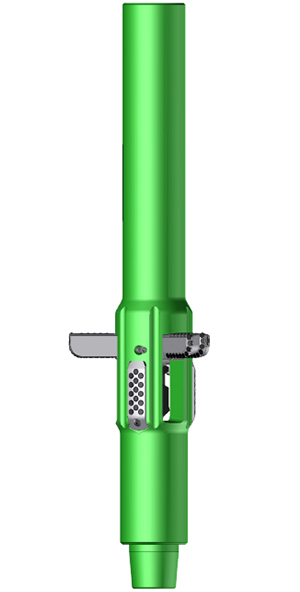 Combining a flip-arms expansion mechanism with unique stabilization features, the X-reamer is capable of enlarging over 100% of the pilot hole size, making it the tool of choice for gravel pack installation, window reaming, plugging or gas storage applications. Each body can be fitted with any size of arms within its opening range. Extra arms can be manufactured and delivered worldwide on short notice. Custom bodies can also be manufactured to accommodate different hole IDs. The X-reamer cutting arms shape is designed to maximize stabilization and reduce the effect of lateral impacts on PDC cutters by presenting a large, passive gauge structure. They feature two rows of premium PDC cutters, for improved ROP and downhole time. Hardfaced stabilizing pads provide reamer stabilization immediately in front of the cutting arms, reducing vibrations and preventing pilot body wear.